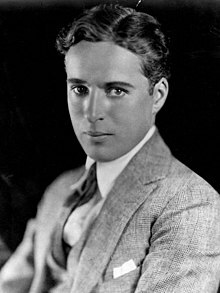 Sir Charles Spencer "Charlie" Chaplin, KBE (16 Aprile 1889 – 25 December 1977) wis an Inglis comic actor, filmmaker, an componer who rose tae fame in the silent era. Chaplin acame a warldwide icon throu his screen persona "the Tramp" an is considered ane o the maist important figures in the history o the film industry. His career spanned mair nor 75 years, frae childhuid in the Victorian era till a year afore his daith at age 88, an encompassed baith adulation an controversy. ↑ Cousins, p. 72; Kemp, pp. 8, 22; Gunning, p. 41, Sarris, p. 139, Hansmeyer, p. 3. This page wis last eeditit on 18 November 2017, at 19:49.